Description of "The Alpha and The Omega and Other Stories"
'The Alpha and the Omega and Other Stories' focuses on different characters, different moods and different situations which would definitely bring you to ‘The World of Kiranetic Ideas’. ‘Motorcycle’ would tickle your funny bones till the end. Some stories, like ‘Fear of Defeat’ and ‘Beauty at the Window, have the pinch of suspense which you would really enjoy if you do not go to the end of the stories before you reach the last lines. In some cases you would feel whether such a thing or such a person would really exist. Well, I am here to entertain you with the book, full of characters imaginable and unimaginable, which I feel would be interesting to share with all. Strolling alone down the Mahatma Gandhi Road at around ten p.m., I felt I was followed. I turned round and found none. Resuming towards my house, I thought of Shalini who had been the centre of attraction at the party I was retuning from. Immediately, I heard someone saying, ‘Forget her’. Again I twisted round and got nobody. It was just a fantasy I decided and continued to walk, after taking the narrow lane with the trees on either side of it. A tree showed some movement. And I sensed that I was pursued………. U. A. Kiran is a Commerce graduate, born in Kerala, educated in West Bengal employed in Andhra Pradesh and now in Goa. 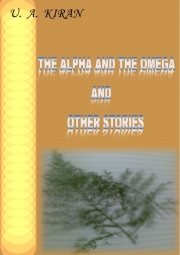 Reviews of "The Alpha and The Omega and Other Stories"